As I mentioned in my last post it rained all day Friday in Pucon so we delayed our exit for a day and spent the day catching up on laundry, e-mails, route planning and napping. I managed one picture out the hotel window, nothing but rain all day. 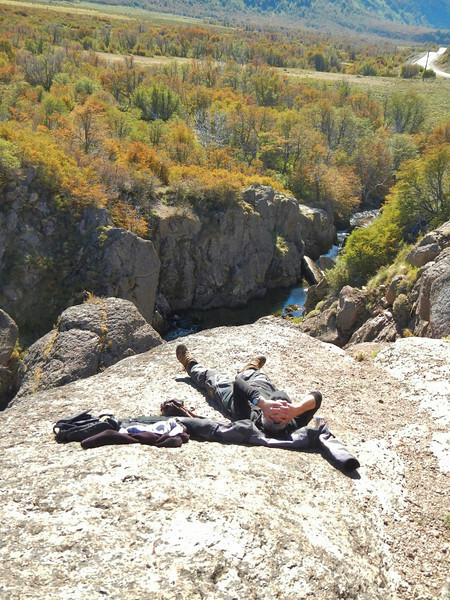 We spent time with Keith, Dave and Jim trying to decide on a route to Buenos Aries. Keith is having trouble with his front shocks and wisely decided that he should stick to pavement. 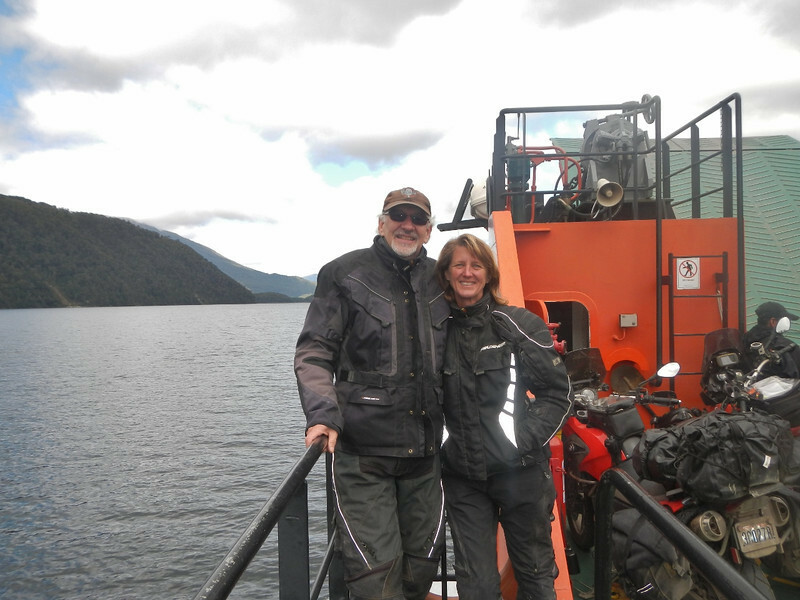 We looked at routes south and nothing really caught Deby or my interest so we essentially decided to stay another night near Pucon and ride into Argentina via the dirt road and on a 1.5 hour ferry ride that Michael took the day before. 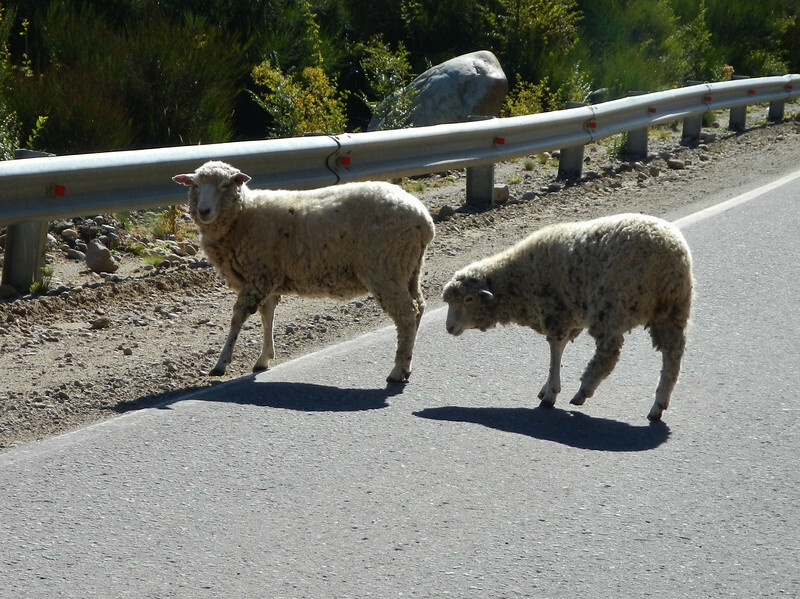 Dave, Keith and Jim decided to ride south with plans to meet us Tuesday on the Argentina side. 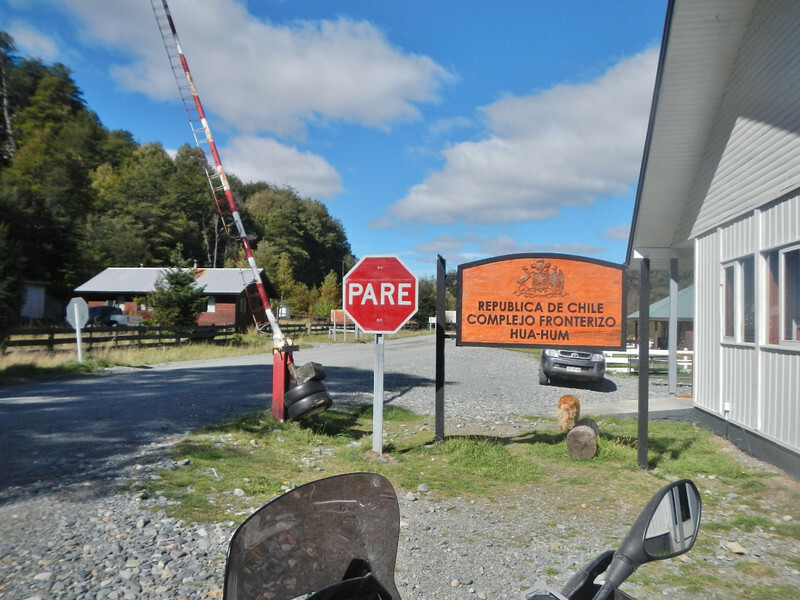 On Saturday we made the grueling 30KM ride to the Hotel y Termas Huife Resort. 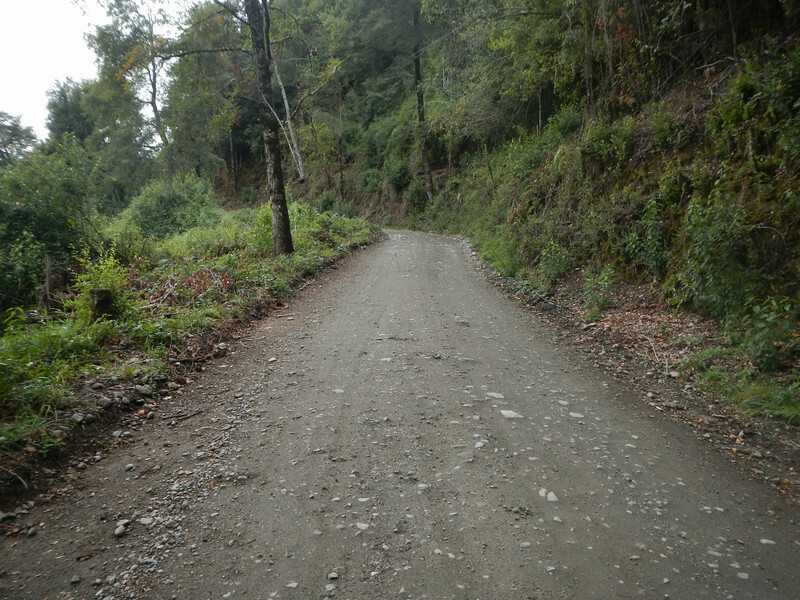 It took us all of a half hour to ride the nice paved road to the resort. I was wondering why we didn’t go a day earlier. It was a little out of our normal price range but we justified it by calling it an anniversary/birthday gift and made up our minds to enjoy the stay. 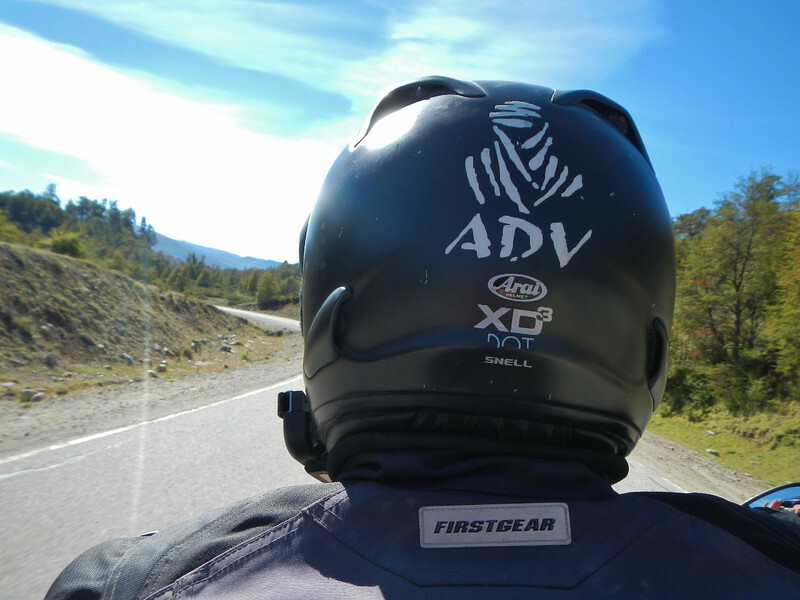 Adventure riding on motorcycles can be tough but we managed to have a relaxing day soaking in the therapeutic hot springs an enjoying the fine dining. 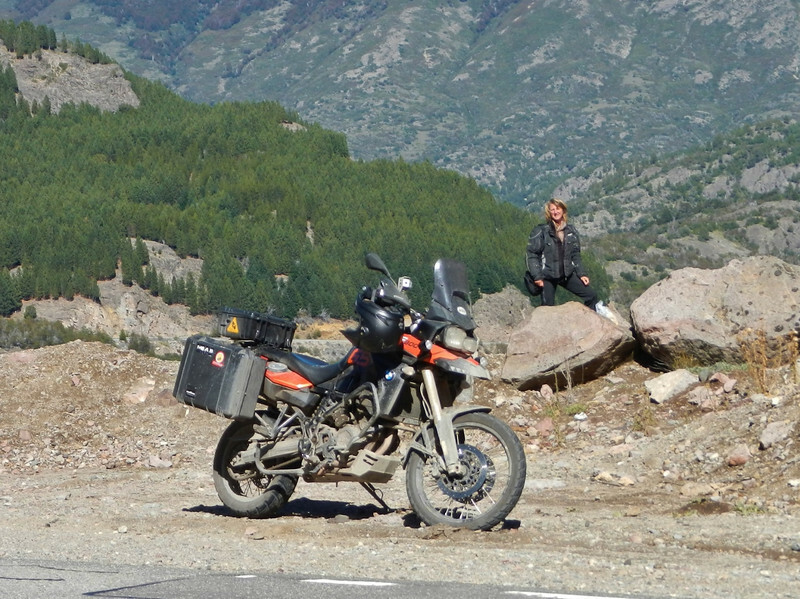 When we pulled into the parking spot for our room we parked next to a BMW R1200 with Chile plates. Later at dinner we met the couple on the bike, Edwardo and Francine. 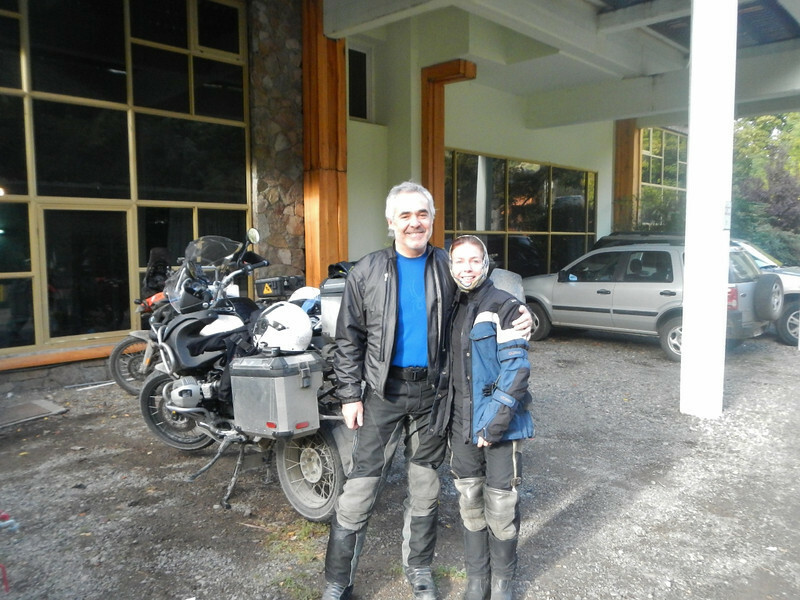 Francine spoke very good English so we struck up a conversation about motorcycle travel and the best routes in the area. 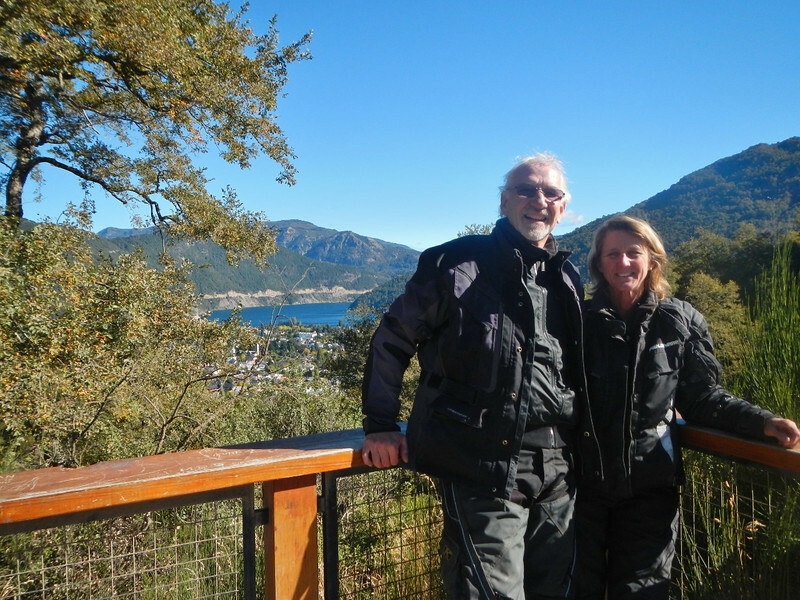 We found out that they met Michael two days before at the ferry, small world.They originally had plans to return to their home in Santiago on the Chilean side of the mountains but after talking they decided they liked San Martin so much they wanted to go back. 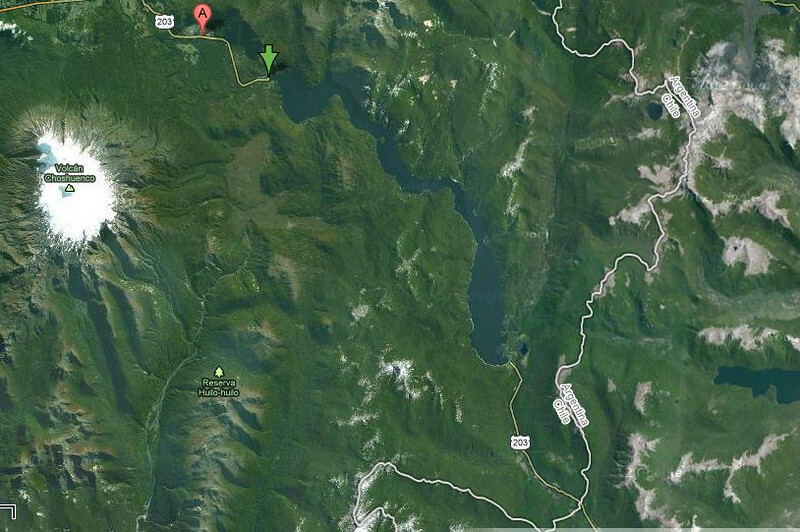 They even knew a “shortcut” through the mountains on a gravel road that would get us to the ferry sooner. Hey, why not! So we made plans to leave the Huife hot springs at 9:00 for San Martin. We didn’t have reservations for the ferry that Michael recommended but Edwardo and Francine seemed confident we wouldn’t have a problem on a Sunday morning during the off season so off we rode on a cool fall day. 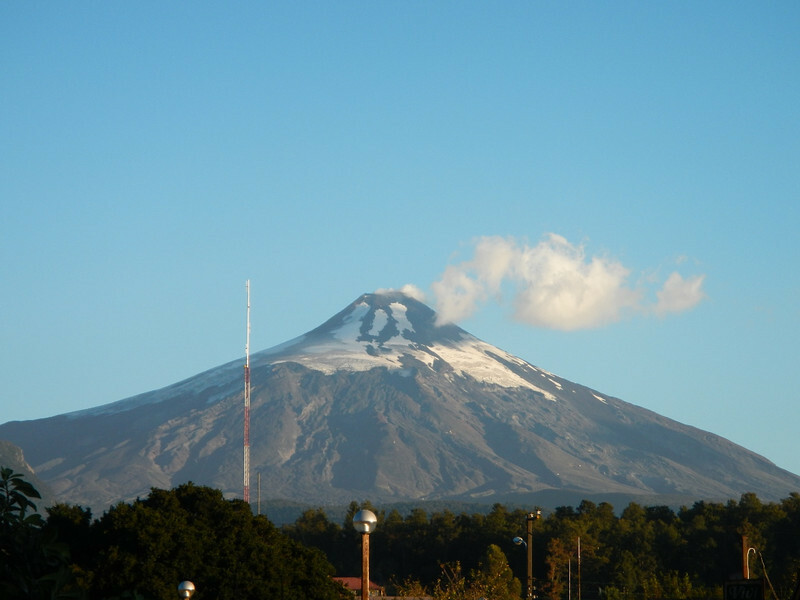 Remember this picture of Volcan Villarrica I took a few days earlier? 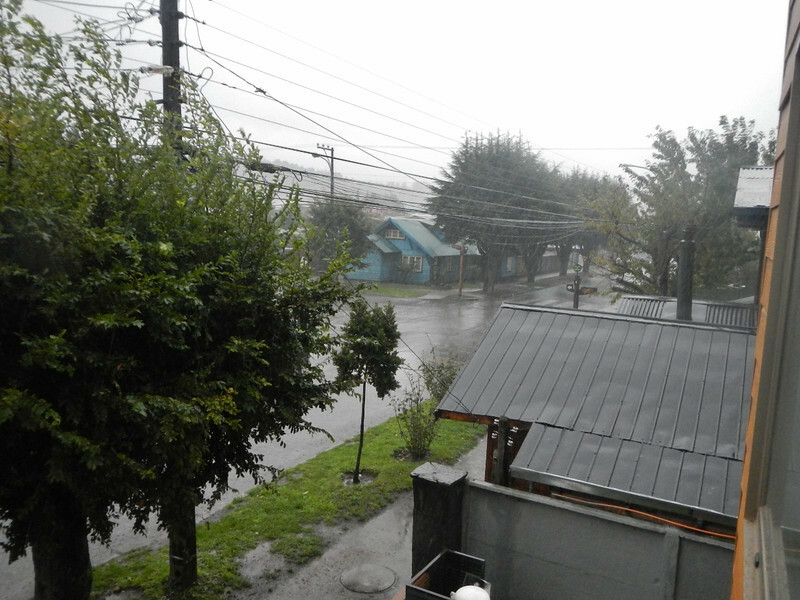 Here’s what it looked like Sunday morning after a day of rain in Pucon. Plenty of new snow in the mountains, fall was in the air. 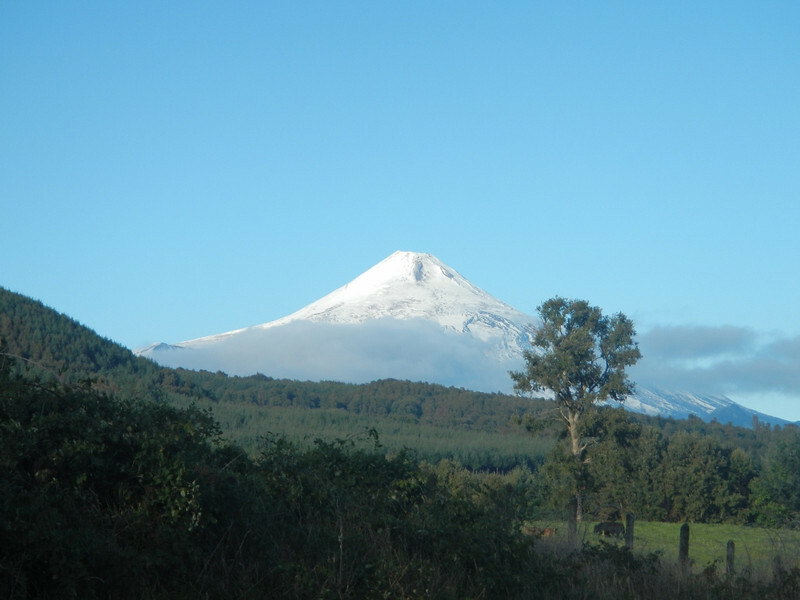 It was a great day of riding, we returned to Pucon, then west to Villarrica before we turned southeast towards the mountains. 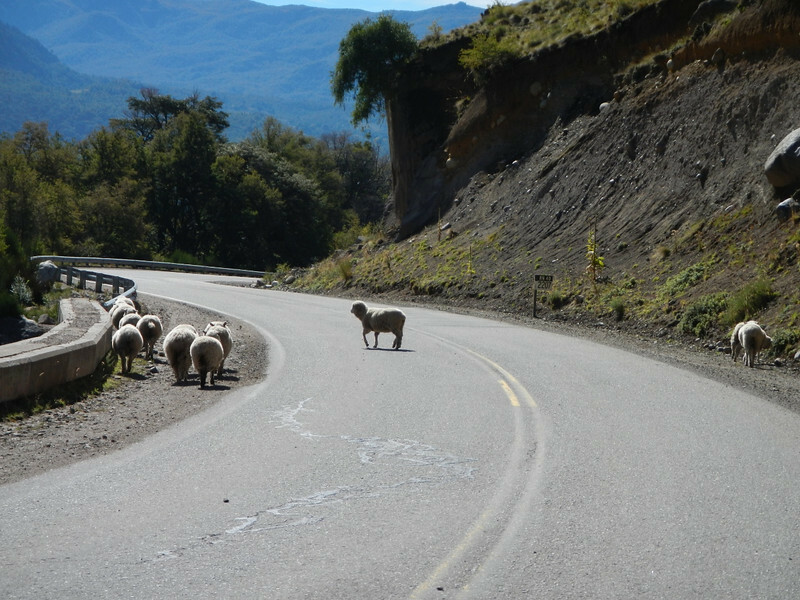 The road immediately turned to gravel and stayed that way for the next 90 miles through the Andes. The rains from the previous days was enough to keep the dust down but the road was not too muddy. Our tour guides were fantastic although I couldn’t exactly figure out how someone could ride an R1200 (not GS) with Tourance street tires with two people full out on gravel roads hitting 50 to 60 MPH and still waiting for us at the turn offs. Edwardo was a rock star on that bike, we later learned he had a lifetime of experience riding enduros. Fun. We arrived at the Puerto Fuy ferry dock almost exactly at noon which is what was recommended for the 1:00 ferry, the only one that goes east all day. 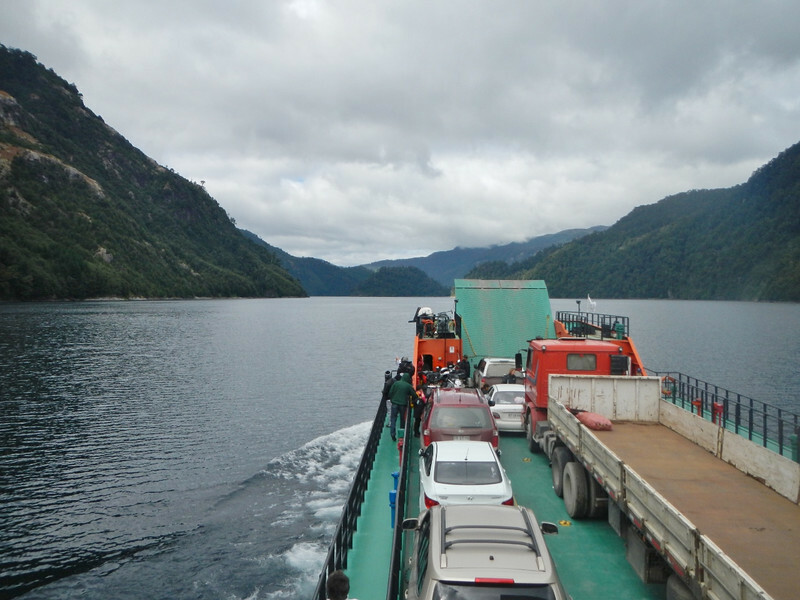 This ferry is part of highway 203 route to Huahum Pass into Argentina and transverses Pirihueico Lake. We made it on with room to spare. As usual, Deby picked up most of the flinging mud being in the rear. 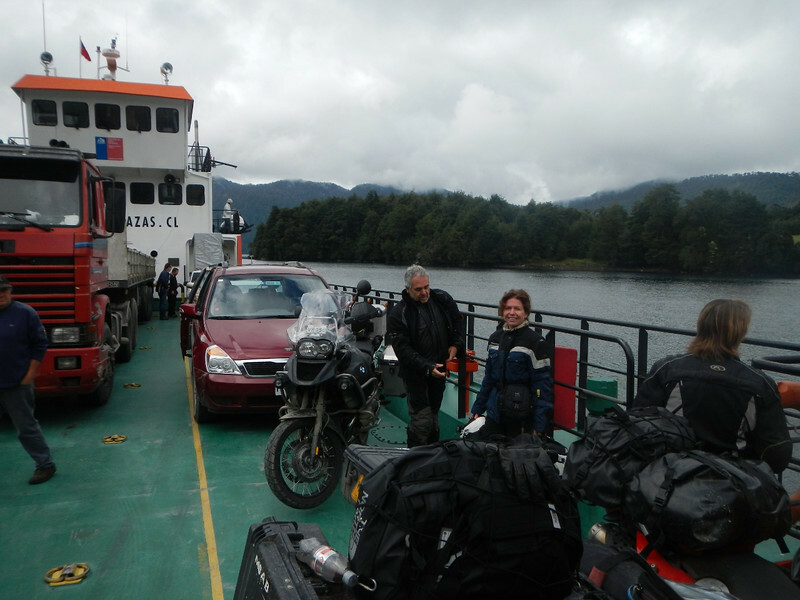 Edwardo and Francine with Deby and the bikes on the ferry. It was a long ride on a beautiful lake, I only counted three houses along the whole route that must only be accessible by boat. It reminded me a little of some of the lakes in the North Cascades of Washington State. A crazy thing happens when the boat docks at the eastern shore, it’s only 9KM to the Argentina border on a gravel road and everyone wants to be the first on there to get in line. Of course, Edwardo and Francine were first and left us in the dust. We hauled A$$ and were third behind a pickup truck that was determined to beat us. Seriously, we were easily doing 60mph on loose gravel trying to keep up. Deby called it Mr. Toad’s Wild Ride. It was not problem getting across, probably the fastest border crossing yet. I loved the remote crossing in the middle of nowhere on a gravel road. 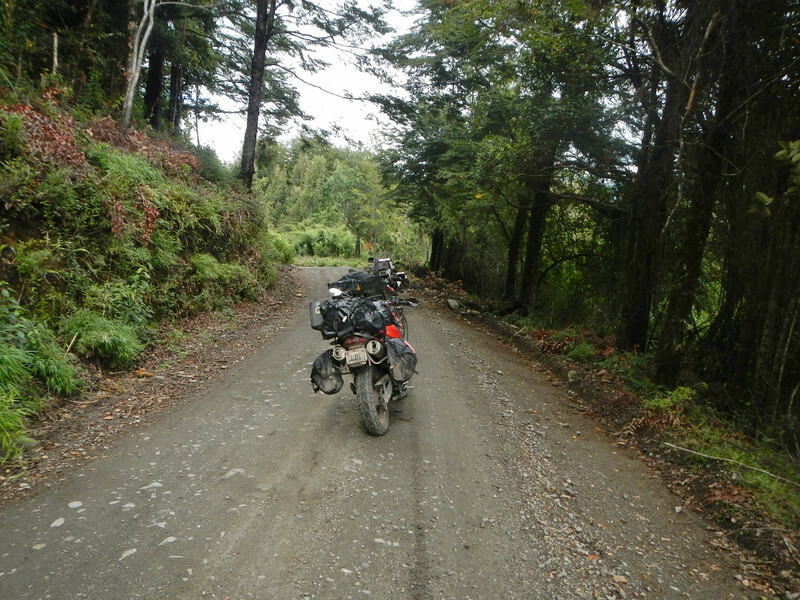 We still had more gravel to go before our destination, I think Edwardo slowed down a little for us so it was about 5:00 when we arrived in San Martin. We stopped at this scenic overlook of the city where they took our picture. 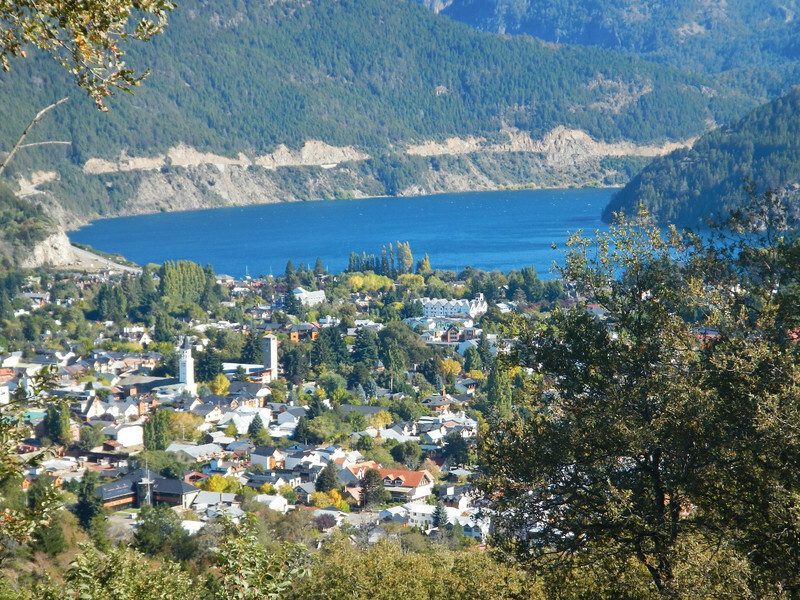 Here is a closeup of the city over our shoulders, a major ski resort town nestled in the mountains next to a lake. When we got into town they had a favorite hotel picked out and even negotiated a discount rate which was pretty reasonable for a 4 star hotel. I like those guys, they know how to travel! 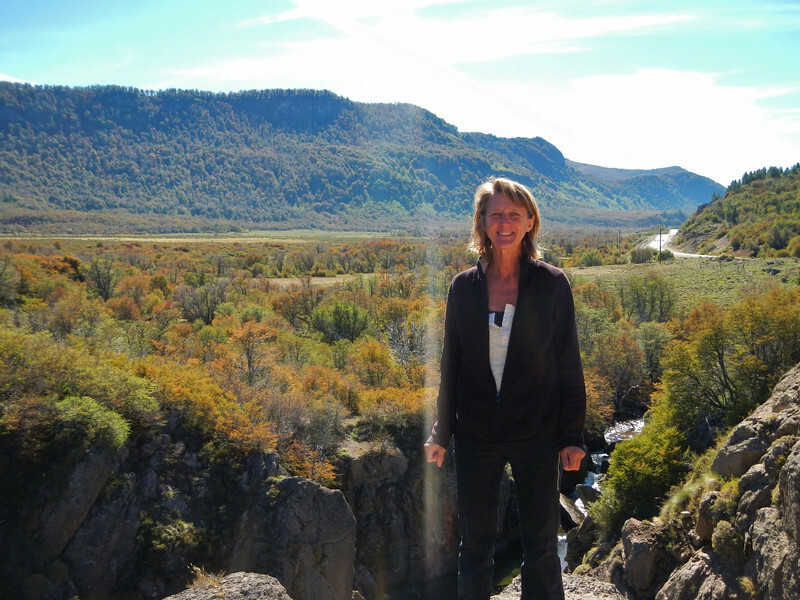 On Monday, Deby and I decided to spend a day exploring San Martin. Too often we arrive at these fantastic cities and check into a nice hotel only to get up early to leave the next day. Edwardo and Francine tried to persuade us to ride with them north on some more dirt tracks, it was really tempting but for some reason I was ready for a day off. Wait… didn’t I just spend a day at a hot-springs resort? Hmmm, must be getting tired. Reluctantly we said goodbye to our new friends. 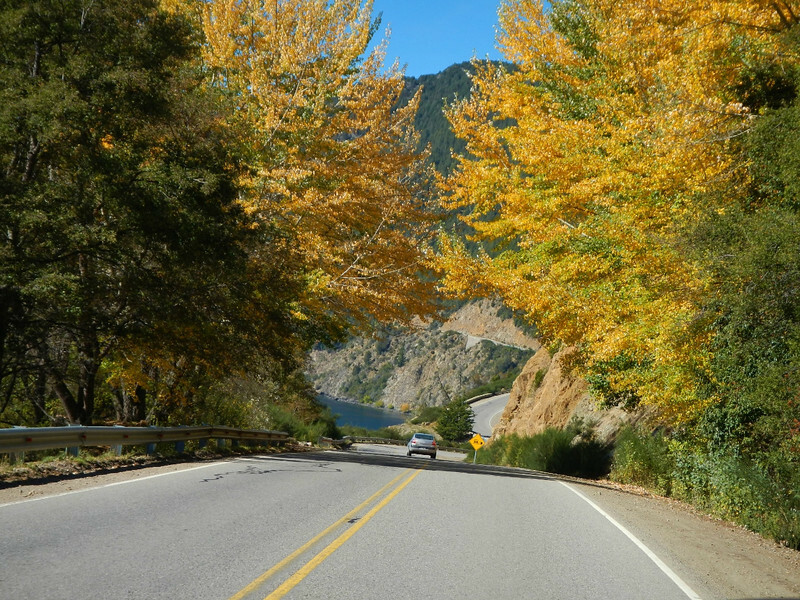 Instead of beating ourselves up on dirt roads we explored the town, took care of exchanging some money, washed some clothes, did a little shopping and since it was a beautiful, sunny fall day we packed a lunch and rode into the mountains for a short hike and picnic. For variety, Deby decided to ride on the back of my bike. Instantly she remembered why she likes riding her own motorcycle. Here was her view. We found a nice picnic spot. Overlooking a beautiful valley full of fall colors. A nice spot for a short siesta. Before we rode back on a nice paved twisty road. We came across some local wildlife. Beautiful fall colors…. it’s weird having fall in April. 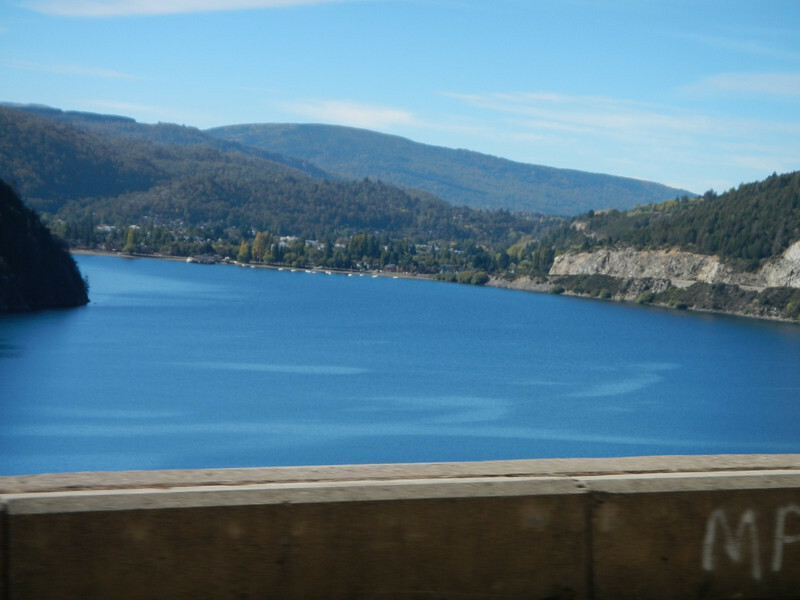 The road winds around the lake before dropping into San Martin, seen in the distance. Back in town we went for a walk and saw these birds in a park. 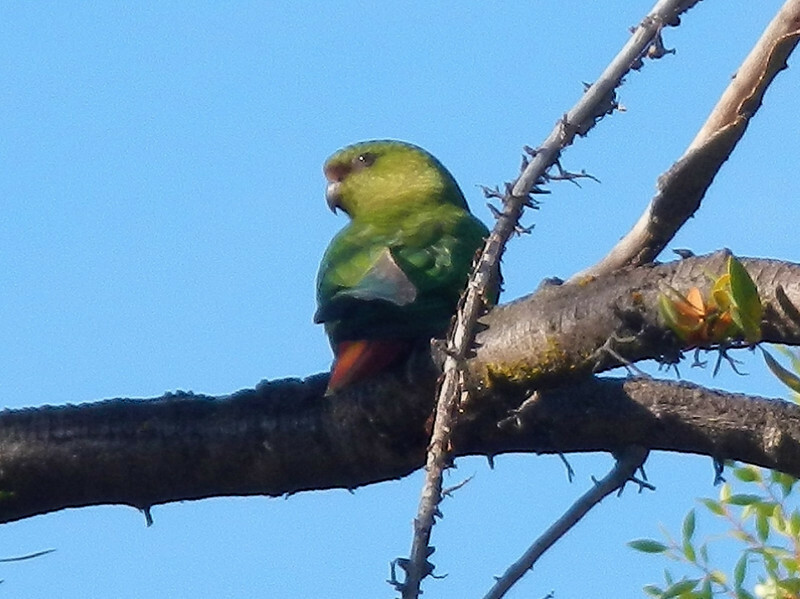 We’ve been seeing flocks of parrots and I finally got a picture of one. 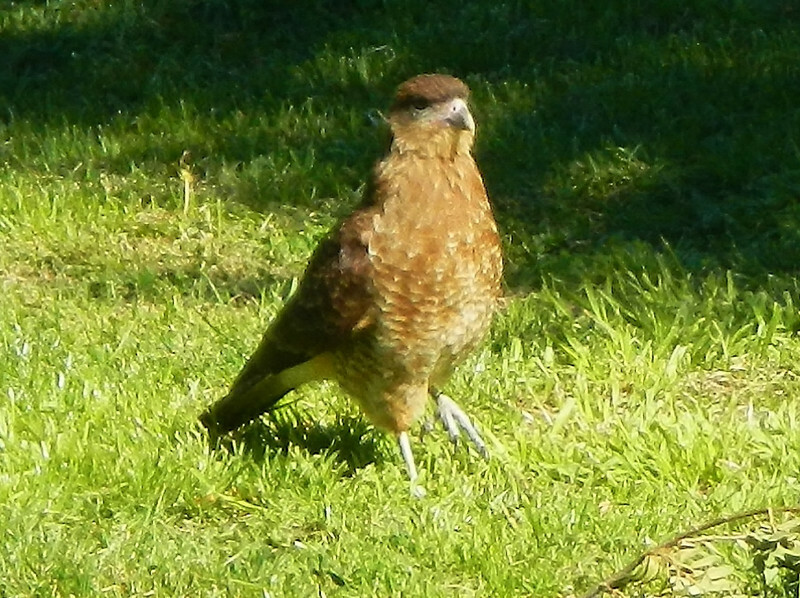 We saw a lot of these birds that look like small hawks but walk around on the ground. Not sure exactly what they are but they were pretty cool. 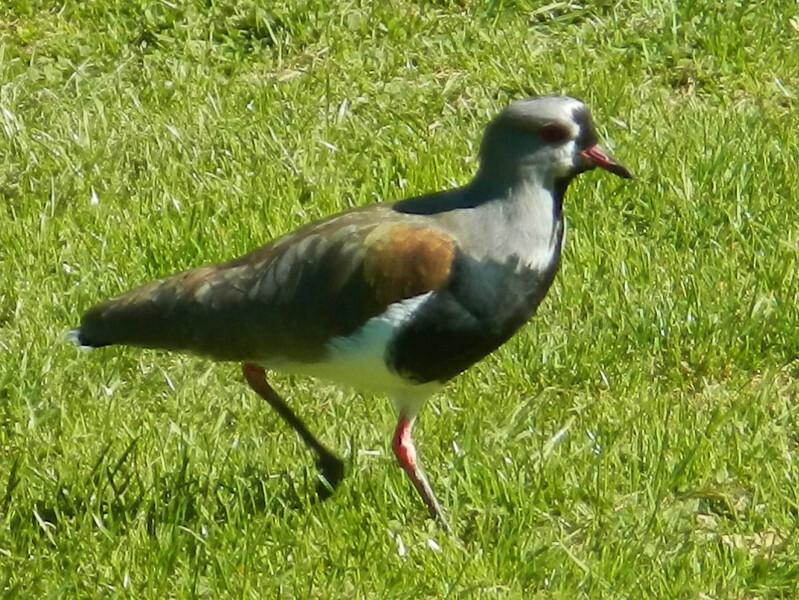 And finally, we had been seeing a lot of these birds that seemed like a shore bird but were walking on the grass picking out worms. None of these birds seemed to spooked of me getting close with my cheezy little camera to take their picture. 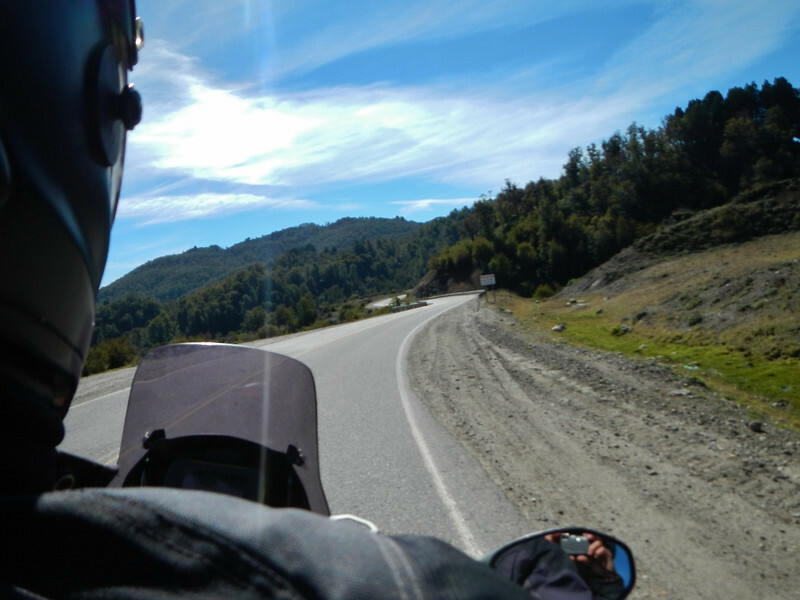 Most people we’ve meet wince when we tell them we’re riding east to Buenos Aries. Really? They ask, where are you going to stop along the way? The adventure continues…. at least for another 12 days. 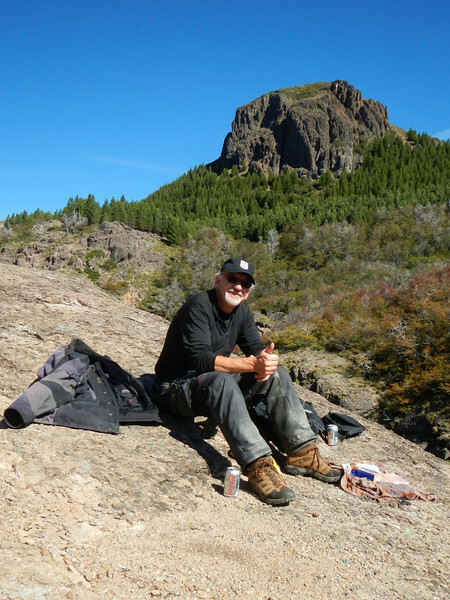 Check out Dave’s blog about his last few days HERE. 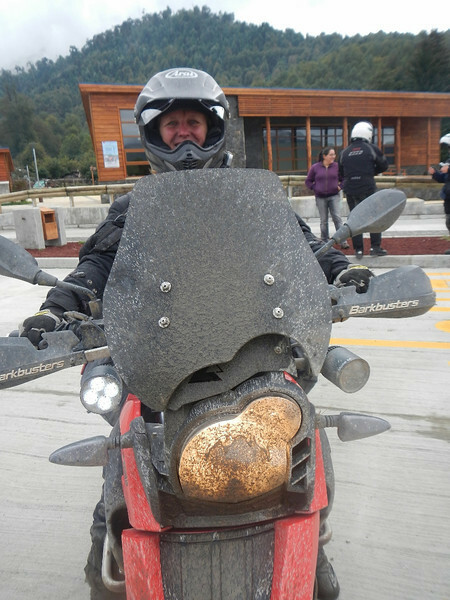 This entry was posted in 2013 Argentina, 2013 Motoraid II, Motorcycle Adventure by donnh. Bookmark the permalink. so fun seeing the birds ! Deby , are you keeping track of lifers ?? I don’t know if you will get this today, but, if possible, please let me know if Dave and Keith got my travel arrangements for Dave. He should leave tomorrow (Saturday 13th) from Bahia Blanca and then from BA tomorrow night. I bought plane tickets for him for both the internal flight and the one on to Portland from BA.